Conveniently positioned just moments from Hamilton Island, Australia’s Whitehaven Beach in Queensland is officially one of the world’s best beaches as rated by millions of Trip Advisor travellers. 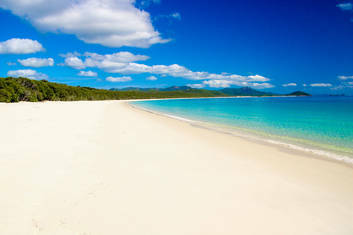 Trip Advisor’s most recent ‘Top Ten Beaches in the World’ list describes Whitehaven as “a piece of heaven” stretching for 7kms along Whitsunday Island. This, the most photographed beach in Australia, is a must see for visitors to the Great Barrier Reef. By using neighbouring Hamilton Island as a base, the famed pure white silica sand and crystal clear waters of Whitehaven Beach can be reached within ten minutes. Hamilton Island offers no less than ten exciting day trip options to Whitehaven including scenic flights by seaplane or helicopter, sailing by boat, yacht or catamaran, scuba diving and snorkelling. Hamilton Island, a Whitsunday Island located at the edge of the Great Barrier Reef, offers a wide range of accommodation options including luxurious, award-winning qualia. There are also numerous restaurants, bars, pools and shops, not to mention over 60 different activities, and all within a short direct flight from Sydney, Melbourne, Brisbane or Cairns. There are also great connections from other Australian cities.